Flow dynamics of normal vs. cancerous capillary. For University of Texas M.D. Anderson Cancer Center Doctorate Student’s Thesis. The image below shows my preliminary pencil sketches that I presented to the client. 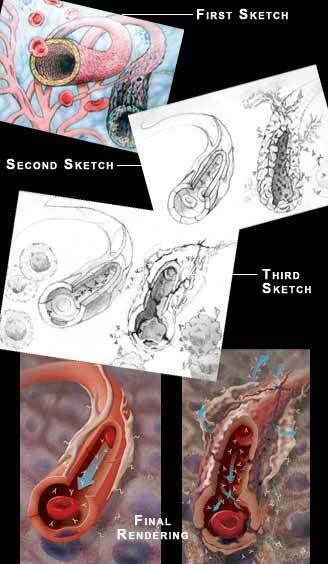 The first sketch was a full-color sketch that pretty much depicted a representative style suggesting colors and textures that might be used, but significant changes were suggested, which led to the 2nd and 3rd black-and-white pencil sketches, from which the final rendition was produced. For over 20 years Dan Futoran has produced quality graphic art and illustrations. Dan's emphasis has been on medical illustration, and many of his works have been published in medical journals, corporate marketing publications, instructions for use manuals, and on trade show posters worldwide.